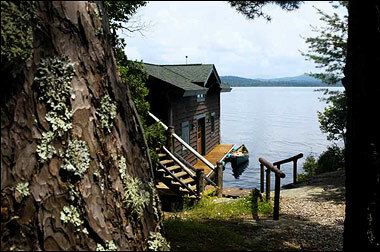 Dry Island is located 2000 feet off the North Shore of Upper Saranac Lake, often described as the "crown jewel" of the Adirondack Lakes. Upon arrival at our mainland dock for your 10 minute journey to Dry Island, you will be greeted with champagne and hors d'oeuvres. 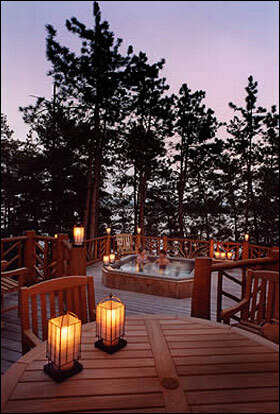 An Adirondack rustic resort would not be complete without a hot tub to enjoy year round. Cuddle with that special someone and enjoy a cocktail as you relax by the campfire in the lean-to, or just sit back and read quietly as the waves gently lap against the rocks below. Walk the Island Nature Trails and listen to the birds. If you prefer an early morning exercise session we have a wonderful personal fitness instructor on call who does everything from very gentle bending and breathing exercise to vigorous aerobic sessions. There are no mechanical exercise machines on the island. We try to do everything in an all natural atmosphere. Built completely in the air, the tree house has a queen bed on one side and a twin bed on the other. No electricity or running water! It's as close to nature as you can get. Only for the adventurous type. If you have flash capabilities, please click here to watch a Movie about Dry Island.. To view more photos please join us at the Photo Gallery of our Facilities.